The crackdown on journalists in Turkey continues. Earlier this week, another wave of journalists were summarily sacked, apparently for writing reports critical of the government (an issue that we have repeatedly highlighted on this blog). Late yesterday, journalists from Vice News were charged by prosecutors with “aiding a terrorist organization” under the country’s dangerously vague terror statutes. Amnesty International has condemned their arrest and called for their immediate release. Turkey has a dismal record of abusing its anti-terror laws in order to suppress dissent, frequently targeting journalists. Frederike Geerdink, an international journalist based in Diyarbakir was prosecuted earlier this year in a baseless case, accused of “making propaganda for a terrorist organisation”. She was acquitted by a local court in April,but the case remains pending on appeal. Journalists in Turkey have come under increased obstructions while filming or reporting from the region, with the escalation of violence between the PKK and the security forces that has occurred since 20 July 2015, effectively ending a three-year cease-fire and a fragile peace process. This is yet another example of the Turkish authorities suppressing the reporting of stories that are embarrassing to them. They should release the journalists immediately. It is completely proper that that journalists should cover this important story. The decision to detain the journalists was wrong, while the allegation of assisting Islamic state is unsubstantiated, outrageous and bizarre. “Violence between the PKK and the security forces has been escalating, as have human rights abuses in this context. It’s obviously a story that they government does not want to be told,” Gardner said. The two British Vice journalists were released yesterday, but a third is still under arrest and held in pre-trial detention. I discuss these developments on Amnesty-USA’s main blog Human Rights Now. 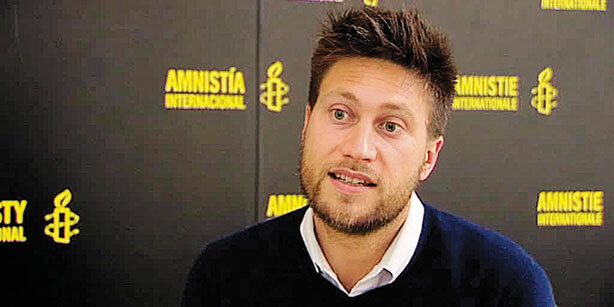 This entry was posted in Amnesty International, Andrew Gardner, Freedom of Expression, Press Freedom and tagged Amnesty International, Andrew Gardner, Detention of Journalists, Press Freedom, Turkey, Vice. Bookmark the permalink.